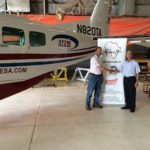 Our 50th Anniversary: A Message from our CEO - Africair, Inc. Yesterday – April 1st – marked a significant milestone in the history of our company as we celebrated our Golden Anniversary – 50 years of service to the African Aviation Community! Our journey has been exciting, with many twists and turns (and not without some pitfalls), but always with the same end goal in mind – to provide the best possible service and support to our customers. Our dedication to service and support has propelled us from a very humble beginning to what we have become now – the largest Textron Aviation Inc. (Cessna and Beechcraft) and Bell Helicopter Textron, Inc. independent distributors in the world. We have offices and personnel strategically located across the continent and our activities have expanded to include new and used aircraft and helicopter sales, leasing, financing, in-country technical support, aircraft brokerage, MRO services, aircraft maintenance and more. Our subsidiary, Tropical Aviation Distributors distributes Cessna and Beechcraft aircraft in the Caribbean and portions of South America, and our affiliate, Propel Aviation Sales & Services, LLC, is an authorized Textron Aviation Inc. maintenance facility with FAA and EASA certification. To our customers and business partners, we say “Thank You”! Clearly our success and longevity would not have been possible without your patronage and support. We appreciate you and are grateful for the opportunity to contribute to the success of your business. To our employees past and present, we say “Thank You”! The cornerstone of every successful organization is the dedication and commitment of its people. Our company has always been blessed with a strong team of highly motivated and talented individuals – many of whom have spent the majority of their careers with us. Our success is their achievement for which we, the owners, are grateful. To Textron Aviation, Inc. and Bell Helicopter Textron, Inc., we say “Thank You” for granting us the privilege to represent the finest aircraft and helicopter manufacturers in the world, and for your continuing commitment of support to our mutual customers in their very challenging operating environments. Although much has changed over the years, somethings remain the same and will never change. Africair is still a family owned and operated business (the Jones and Evans families). We conduct our business ethically and fairly. We highly value the personal nature of our business relationships and the trust that our customers place in us. We quietly give back to the communities where we do business. We are genuinely concerned for the well-being of our customers, employees and business partners. So, as we embark on the next phase of our journey, we will honor the principles noted above that have led to our success. We look forward to continuing our relationships with you and remain committed to providing you with excellent service and support. On behalf of the Jones and Evans families, we thank you again and wish you all the best.